Extending over an area of 13,019 sq. kms, this national park is reckoned to have the greatest Tiger reserve in India. Named after the legendary Jim Corbett, a figure known in the domain of conversationalists, naturalists and photographers, this sanctuary is the abode of tigers, elephant, Yellow throated Martens, hog deer, Himalayan bear, Leopards, Nightjars, Barking, Otters and the Bengal Tiger. 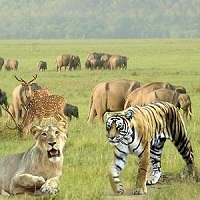 The extravaganza of being in this place is multiplied with the help of the Jeep safari and the Elephant safari. Taking you through the muddy tracts, our jeep safari will enable you to delight in the spectacle of a herd of monkeys, elephants, tigers, etc. The elephant safari is also designed to satiate your desire to see the big cat drinking water. By Air: There is an airport nearby wherefrom we can go to the national park. By Railways: Ram Nagar station is the nearest. Corbett Riverside Resort, Corbett Ramganga Resorts, Dhikala Forest Lodge, Wild Crest Resort, Manu Maharani Resort, Corbett Tiger Den Resort, Jim's Jungle Retreat, Corbett Hideaway, Camp Riverwild, Quality Inn Corbett Jungle Resorts, The Wild Safari Lodge, Infinity Resort, Corbett, Corbett Jungle Retreat, Camp Forktail Creek Jungle lodge and Corbett Kingdom.